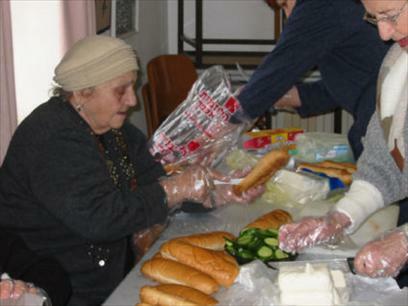 Every morning, elderly women gather to prepare sandwiches for schoolchildren from social-economic deprived homes, who would otherwise go through the day without eating anything. Grandmothers come every morning from 6.30am to prepare more than 550 sandwiches (and a piece of fruit) for 14 schools for children from social-economic deprived homes – these children would otherwise not have anything to eat all day. There are requests for several hundred more sandwiches. The Association of Aid to the Elderly (Rabbi Zechariah & Leah Frankforter) was founded in 1982 primarily for aid to Holocaust Survivors, and the Frankforter Center for the Aged, a Day Care Center for the elderly who come to the center every day, was established with the support of Rabbi Zechariah and Leah Frankforter. There are various programs and activities available at this Center. It has four floors accessed by an elevator and on each floor different activities take place. Every day, the frail elderly come here from early morning until 2 pm and partake in breakfast, a snack and hot meal. The aim is to keep the elderly in their familiar surroundings while providing them with all necessary services such as medical, dental, social workers, social activities, classes in handwork, languages and the possibility of participating in organized day trips. Also the development of new skills becomes evident because of stimulation by social activity. There are 600 elderly who are registered at the Center in the mornings, and in the afternoons approximately 120 pre-retirerees also participate in organized activities. The types of program offered are handiwork classes – artwork, silk printing, knitting, doll making. All these works are then sold in our non-profit Gift Shop. There are also classes in Hebrew, English, Computers, and Memory Improvement. Exercise. Dance classes are also arranged and there are two choirs which rehearse and perform at various events which are all performed by the elderly. There is also a synagogue where religious services and facilities are available. Our objective for the "Sandwich Program" is to provide sandwiches for additional schools. Unfortunately, the number of families who cannot afford lunches for their children is increasing all the time. Our project sets us apart from others in the same field in that we are forging a link between generations – the grandmothers and the schoolchildren. 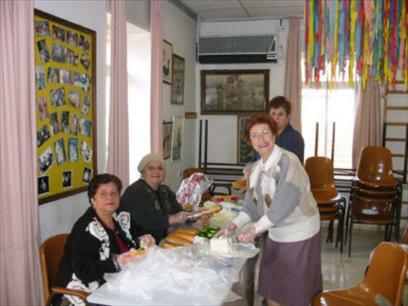 To show their appreciation, many of the schools send the pupils here to entertain our elderly – Chanukah, Purim, etc. No other elder day care facility in Jerusalem has this reciprocity! BEIT HATZIYUR SCHOOL - This is a school for children with special problems, broken homes, drugs, physical abuse, etc. There are 88 students in the school, (14 of whom live in a hostel during the week as they cannot go back to their homes). Each class has 5 pupils and 3 teachers. They stay at the school until 6 p.m but receive a hot meal at 3.30 p.m. at minimum cost. However the sandwiches are extremely welcome (eaten at the traditional 10am snack time) to brighten their day. The pupils are amazed that people care about them sufficiently to bring them food very day. As a way to show their appreciation and say, 'thank you", the headmaster suggested that the children who received the sandwiches now help the center by repairing the center's broken items, by delivering plants or even by performing for the Beit Frankforter's grandmothers. If you are in Israel, feel free to come by at 6:30am and help prepare and deliver sandwiches! 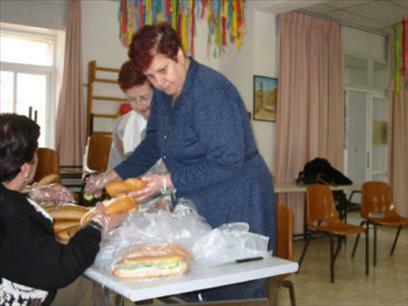 Beit Frankforter’s elders make over 600 sandwiches every day for school children in need, starting at 6am and finishing by 6:30am! Who wouldn't want grand ladies like this in their corner? ?